Round Table about BOLONIA process (3th June 2005) Teacher: FERNANDO CEBOLLADA PRAS XVII CONGRESO INTERNACIONAL INGEGRAF - ADM Prospects for Engineering. 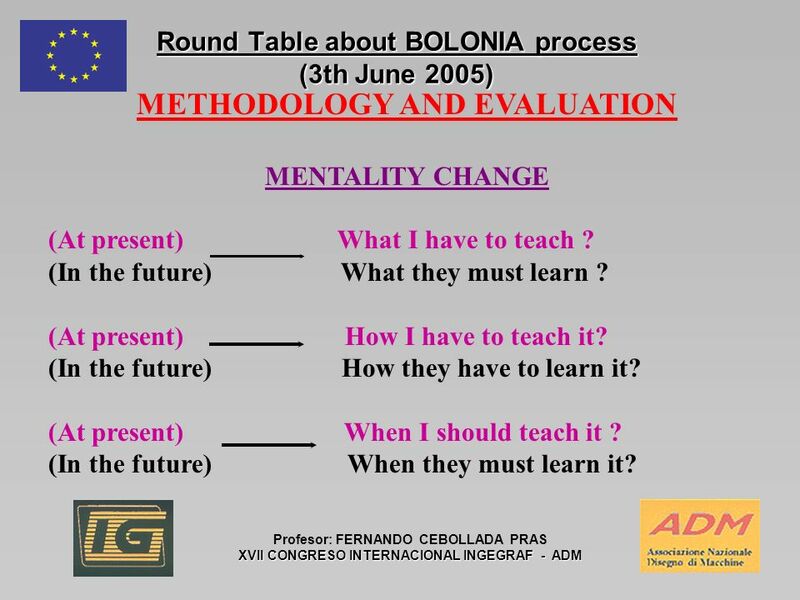 2 Round Table about BOLONIA process (3th June 2005) Profesor: FERNANDO CEBOLLADA PRAS XVII CONGRESO INTERNACIONAL INGEGRAF - ADM METHODOLOGY AND EVALUATION MENTALITY CHANGE (At present) What I have to teach ? (In the future) What they must learn ? (At present) How I have to teach it? (In the future) How they have to learn it? (At present) When I should teach it ? (In the future) When they must learn it? 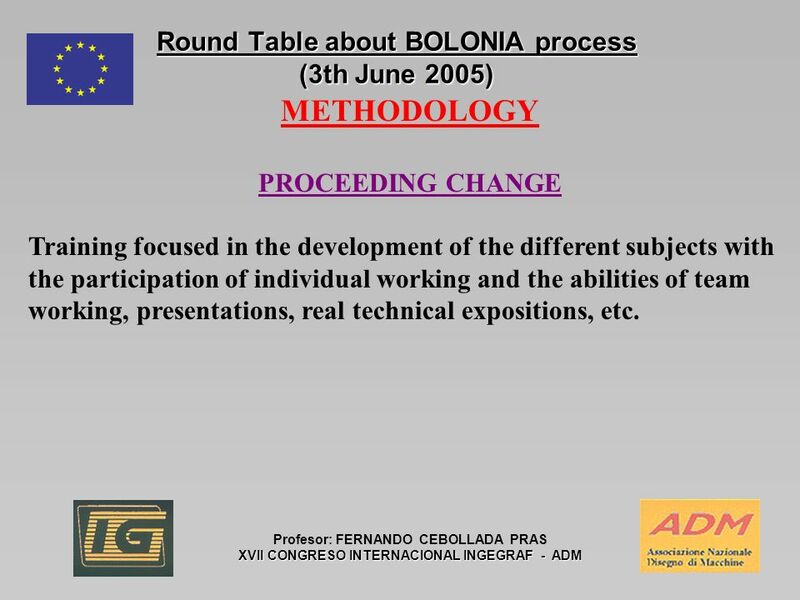 3 Round Table about BOLONIA process (3th June 2005) Profesor: FERNANDO CEBOLLADA PRAS XVII CONGRESO INTERNACIONAL INGEGRAF - ADM METHODOLOGY PROCEEDING CHANGE Training focused in the development of the different subjects with the participation of individual working and the abilities of team working, presentations, real technical expositions, etc. 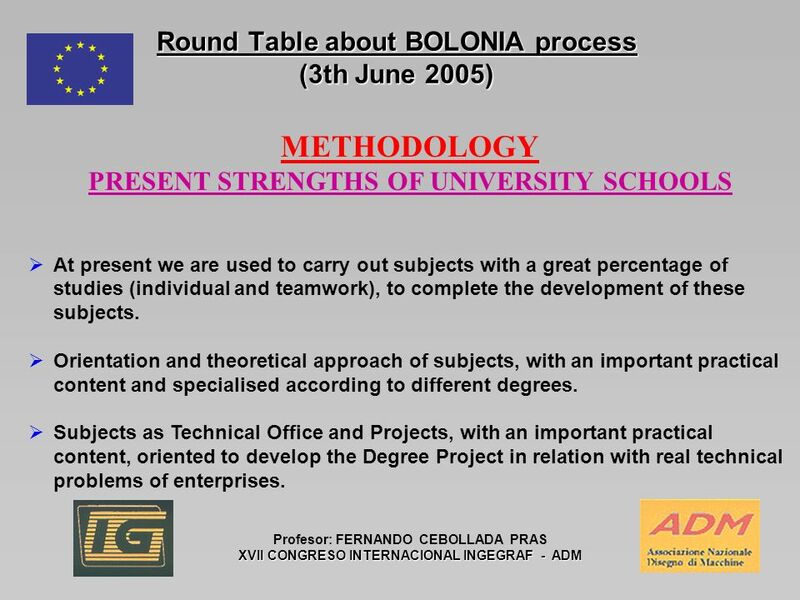 4 Round Table about BOLONIA process (3th June 2005) Profesor: FERNANDO CEBOLLADA PRAS XVII CONGRESO INTERNACIONAL INGEGRAF - ADM METHODOLOGY PRESENT STRENGTHS OF UNIVERSITY SCHOOLS At present we are used to carry out subjects with a great percentage of studies (individual and teamwork), to complete the development of these subjects. Orientation and theoretical approach of subjects, with an important practical content and specialised according to different degrees. Subjects as Technical Office and Projects, with an important practical content, oriented to develop the Degree Project in relation with real technical problems of enterprises. 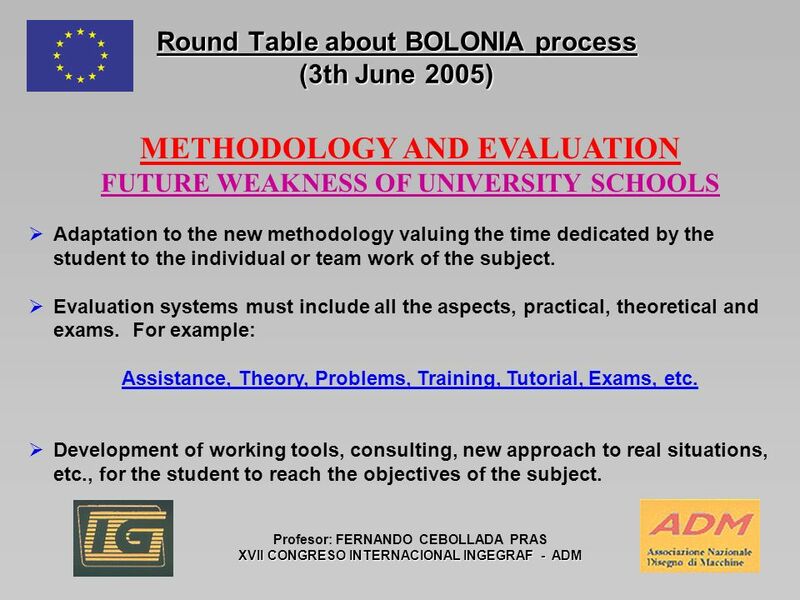 5 Round Table about BOLONIA process (3th June 2005) Profesor: FERNANDO CEBOLLADA PRAS XVII CONGRESO INTERNACIONAL INGEGRAF - ADM METHODOLOGY AND EVALUATION FUTURE WEAKNESS OF UNIVERSITY SCHOOLS Adaptation to the new methodology valuing the time dedicated by the student to the individual or team work of the subject. Evaluation systems must include all the aspects, practical, theoretical and exams. For example: Assistance, Theory, Problems, Training, Tutorial, Exams, etc. Development of working tools, consulting, new approach to real situations, etc., for the student to reach the objectives of the subject. 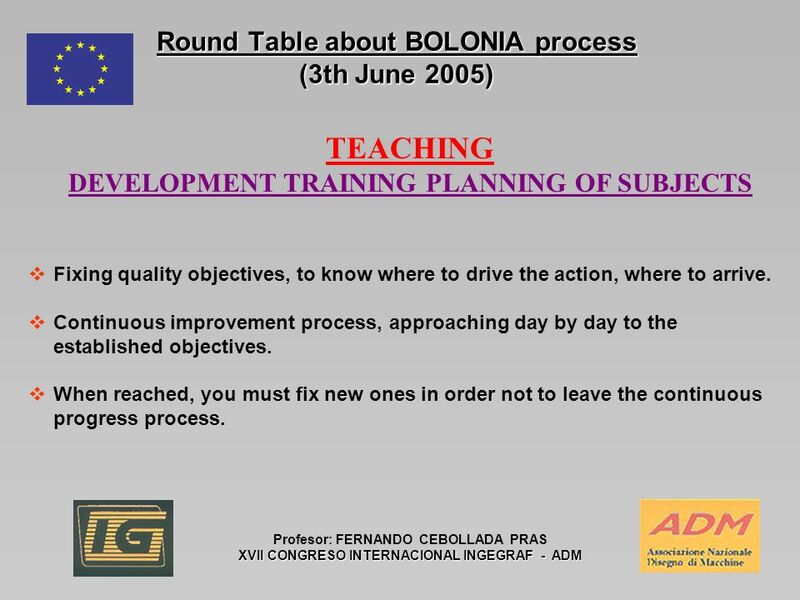 6 Round Table about BOLONIA process (3th June 2005) Profesor: FERNANDO CEBOLLADA PRAS XVII CONGRESO INTERNACIONAL INGEGRAF - ADM TEACHING DEVELOPMENT TRAINING PLANNING OF SUBJECTS Fixing quality objectives, to know where to drive the action, where to arrive. Continuous improvement process, approaching day by day to the established objectives. When reached, you must fix new ones in order not to leave the continuous progress process. 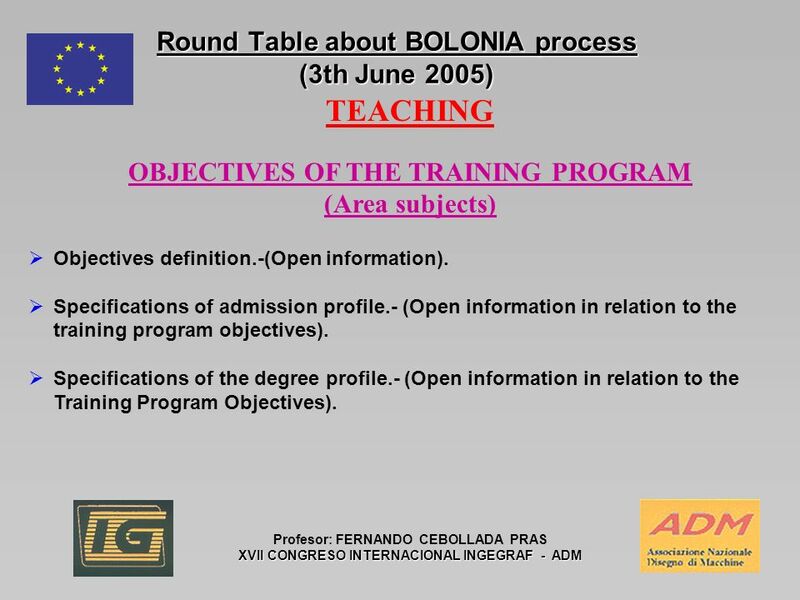 7 Round Table about BOLONIA process (3th June 2005) Profesor: FERNANDO CEBOLLADA PRAS XVII CONGRESO INTERNACIONAL INGEGRAF - ADM TEACHING OBJECTIVES OF THE TRAINING PROGRAM (Area subjects) Objectives definition.-(Open information). Specifications of admission profile.- (Open information in relation to the training program objectives). Specifications of the degree profile.- (Open information in relation to the Training Program Objectives). 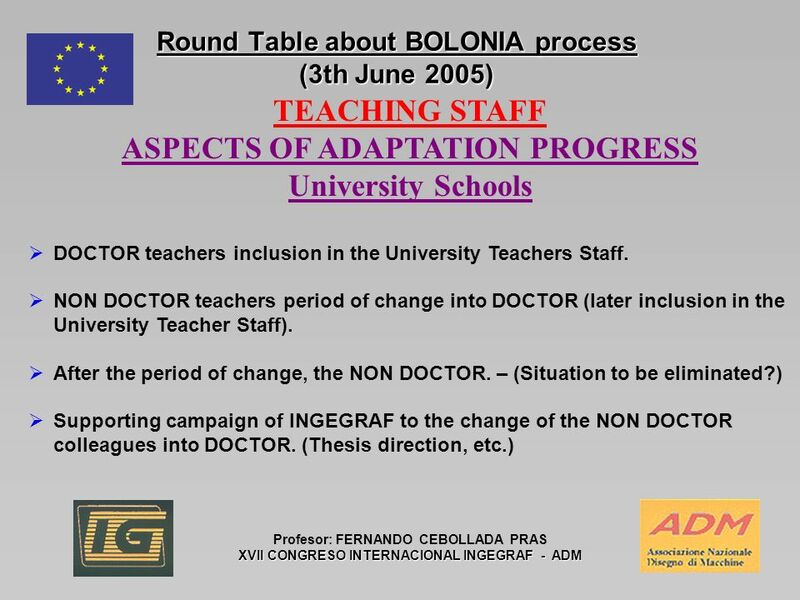 8 Round Table about BOLONIA process (3th June 2005) Profesor: FERNANDO CEBOLLADA PRAS XVII CONGRESO INTERNACIONAL INGEGRAF - ADM TEACHING STUDY PROGRAM AND ITS STRUCTURE (Area subjects) Making sure that the contents of our subjects are connected with the need of each degree. Permanent updating of the contents in order to introduce the continuous changes and all the technological and scientific advances, and to offer a modern and updated teaching Being conscious of the planned training period of the student in order to achieve the objectives of the Training Program. Considering the different alternatives in order to increase and complete the training of our subjects. 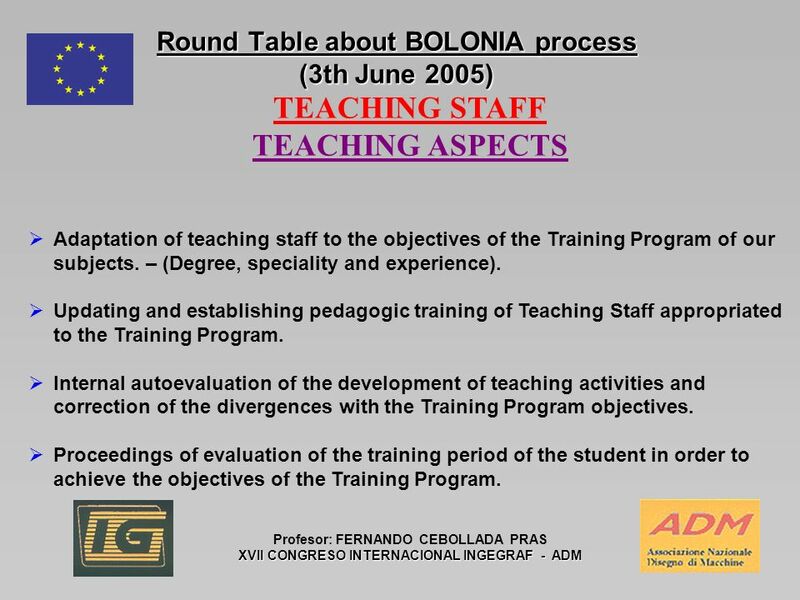 9 Round Table about BOLONIA process (3th June 2005) Profesor: FERNANDO CEBOLLADA PRAS XVII CONGRESO INTERNACIONAL INGEGRAF - ADM TEACHING STAFF TEACHING ASPECTS Adaptation of teaching staff to the objectives of the Training Program of our subjects. – (Degree, speciality and experience). Updating and establishing pedagogic training of Teaching Staff appropriated to the Training Program. Internal autoevaluation of the development of teaching activities and correction of the divergences with the Training Program objectives. Proceedings of evaluation of the training period of the student in order to achieve the objectives of the Training Program. 11 Round Table about BOLONIA process (3th June 2005) Profesor: FERNANDO CEBOLLADA PRAS XVII CONGRESO INTERNACIONAL INGEGRAF - ADM DEPARTMENT STRUCTURE ORGANIZATION AND ACADEMIC DEVELOPMENT Integration of all the Departments Teachers and planning of the criteria to share teaching activities, adaptation according to teachers profile to the different degree. Involvement of the teachers in R+D+I activities. Adaptation (quantity and quality) of the classrooms and students working spaces according to the development of the training program. Availability of rooms and equipments for the development of the duties of academic staff. Administrative and services staff support. 12 Round Table about BOLONIA process (3th June 2005) Profesor: FERNANDO CEBOLLADA PRAS XVII CONGRESO INTERNACIONAL INGEGRAF - ADM INTEGRATION AND CONSOLIDATION PROCESS WILL BE REDUCED, WILL BE REDUCED, IF THERE IS A GOOD DISPOSAL AND COLLABORATION OF THE ALL CONCERNED PARTS TO BE WISHED!! 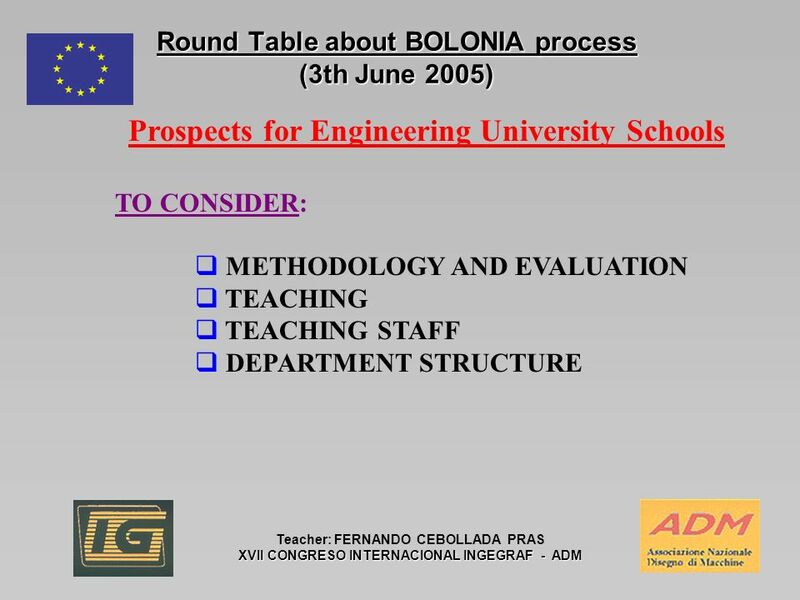 Download ppt "Round Table about BOLONIA process (3th June 2005) Teacher: FERNANDO CEBOLLADA PRAS XVII CONGRESO INTERNACIONAL INGEGRAF - ADM Prospects for Engineering." Multiple Personalities in the Classroom... And I Dont Mean Students! MUHSD Induction Program Special Populations. Special Populations Seminar Objective: Participants will identify who special populations are, what mainstream. SWOT Analysis - teacher education system in Poland Zespol Placowek Edukacyjnych Olsztyn. Characteristics of Good Teachers Resource: Becoming a Teacher in a Field-Based Setting. Implementation of PBL program for 2 nd year students in 2007 Presented by: Dr. Mirwais Sorosh Lecturer, KMU Human Anatomy Dept. How to supervise student for thesis? Prof. Pushpa Raj Sharma Department of Child Health. Smaller Learning Communities Rigor Relevance Relationships Leander High School SLC. Change strategies. Why change? New skills and competencies updating -life long learning searching for new knowledge interdisciplinary and creative problemsolving. ASGHARIA EDUCATIONAL PROJECT PRESENTATION By: AYAZ ALI SHAHANI DIRECTOR SCHOOLS AEP Dated: 25-Jan-2014.